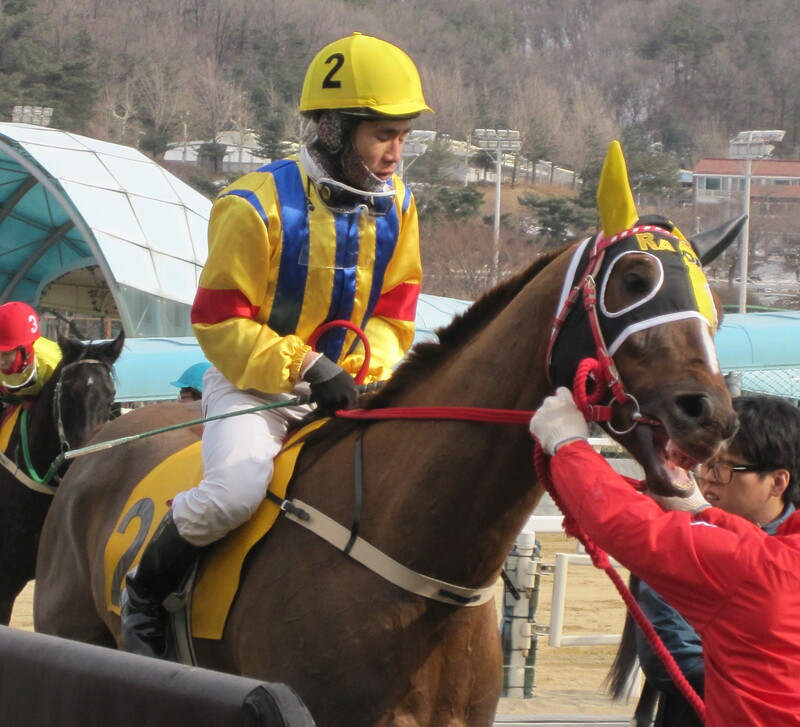 British jockey Darryll Holland will make his Korean debut this Friday. The newest overseas recruit to Busan Race Park is the first Briton to receive a license in Korea and will have 6 mounts on his first day for a number of different trainers. 40-year-old Holland was British Champion Apprentice in 1991 and has won big races across Europe and beyond. Best known for partnering the great Falbrav to victory in the Eclipse Stakes at Sandown Park and the QEII Stakes at Ascot in 2003, he also has wins in the Epsom Coronation Cup, the Newmarket July Cup and the St James’ Palace Stakes among many others. In Asia, he won the Singapore Derby on All The Way in 2000. Most recently, Holland has just completed a winter riding engagement in Barbados. He joins Narazaki Kosuke and Joe Fujii in the foreign jockey contingent at Busan which has traditionally been more accepting of foreign jockeys than Seoul. Kosuke and Fujii are, along with local rider Jo Sung Gon, currently the top jockeys at the track. There has been some immediate support for Holland among trainers. The pick of his 6 debut rides is Raon Boss (Pico Central) for Busan’s top trainer Kim Young Kwan. The 3-year-old colt is on a 3-race winning streak and is one of the leading contenders for the KRA Cup Mile, the first leg of the Korean Triple Crown, in April. Holland was presented to the Busan crowd in a welcome ceremony during racing last Sunday and will wear all-green silks. Dangdae Bulpae keeps on making history. Recording an unprecedented 10th Stakes win under an unprecendented weight for a Stakes winner and taking his earned prize money to an unprecendented 2.9 Billion won, the 6-year-old cruised to victory in the Busan Ilbo Cup this afternoon. Pre-race, the weight was an issue. The three-time President’s Cup winner had never been successful when carrying more than 59kg but, as soon as the gates opened, any doubts disappeared. Jo Sung Gon took Dangdae Bulpae (Biwa Shinseiki) straight to the front and there they stayed. A passenger for most of the race, Jo needed to work a little to keep his mount going straight in the final two furlongs but there was never any question of him not winning. At the line, the margin of victory was 3 lengths, with Dongseo Jeongbeol and Gyeongbudaero, Classic winners both, filling the placings. Because of the weights he needs to carry in handicaps, we;ll likely only see Dangdae Bulpae a couple more times before this summer target; successfulyy defending the Busan Metropolitan City Stakes. After that, it may be that an attempt on a 4th straight President’s Cup is on the cards. It would take a brave punter to take him on. 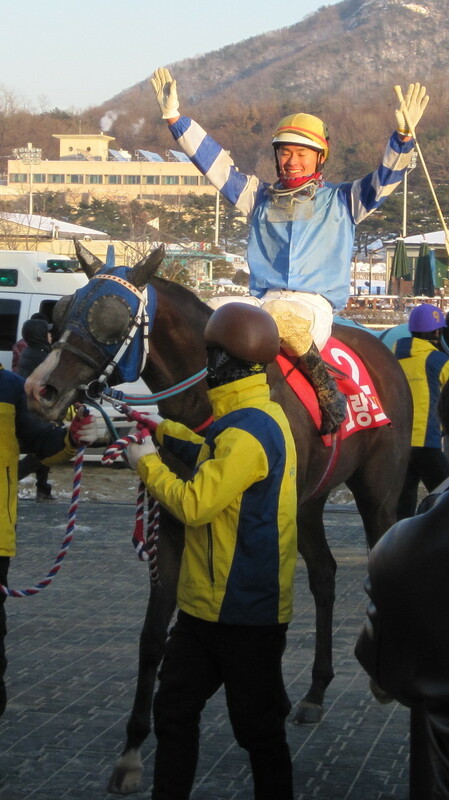 One of very few horses who does have a recent victory over Dangdae Bulpae to her name is Gamdounguibada. And the 2012 Grand Prix Stakes winner was back for her season debut in the finale at Busan. Gamdonguibada (Werblin) recorded a 5 length victory over the always game Viva Ace (Macho Uno). The Champion filly & mare and Champion foreign horse of 2012 is going to be one of the horses to watch in 2013 too. Perhaps the most exciting – and certainly the most intriguing – horse in Korean racing was on show up at Seoul this afternoon. Feel So Good (Ft.Stockton) was bred in Korea but spent his early years in the US and won a race at Calder Racecourse last year. 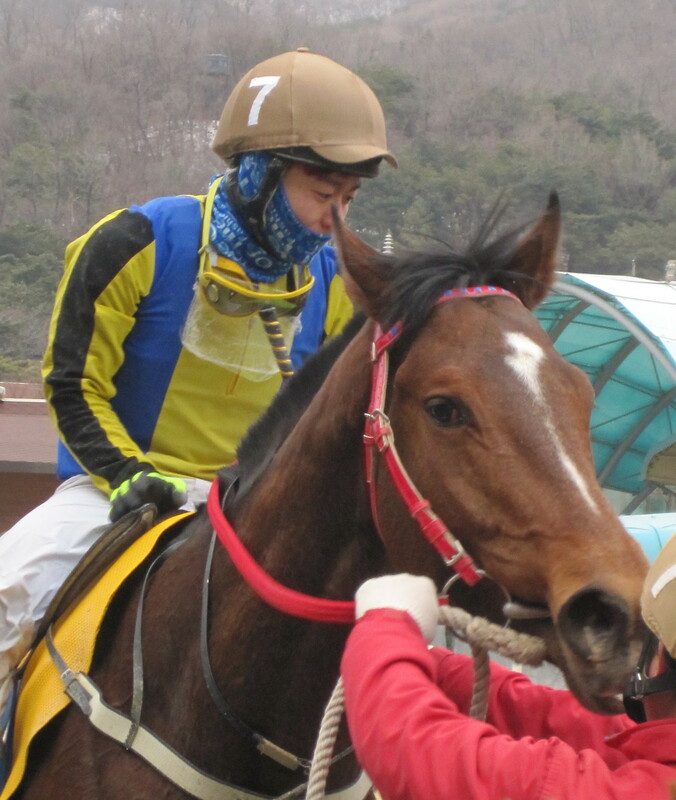 He returned home last autumn and was an easy winner on his Korean debut. It was equally easy today as Feel So Good romped to a 6 length win over 1700 metres without seeming to get out of second gear. This year is going to be an interesting one. 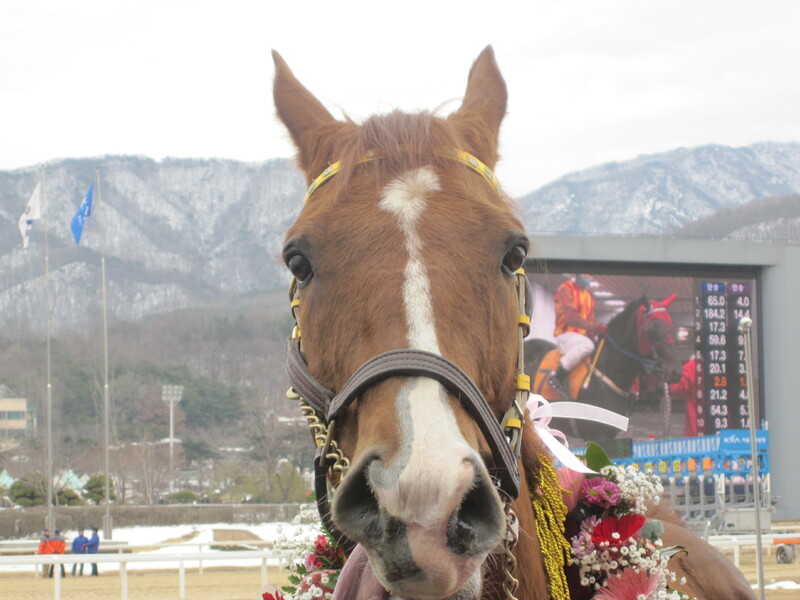 Jigeum I Sungan strode to another impressive win as he claimed the feature race at Seoul Race Park this afternoon. The 2012 Korean Derby winner got better with every run last year and always looked as though he would excel over longer distances. Today did nothing to change that as, having sat comfortably in the middle of the pack for most of the 2000 metre race, jockey Seo Seung Un took Jigeum I Sungan (Ingrandire) to the front with a furlong to run and accelerated away for a 7 length win. It was his 8th win from his 17 career starts and perhaps the easiest to date. New Year’s Stakes winner Global Fusion and the very capable Geuma Champ were beaten out of sight. Indeed, he looked as though he could have gone round again. Relieving Dangdae Bulpae of the President’s Cup crown that he has held for the last 3 years is the ultimate aim for Jigeum I Sungan this year. Korea’s richest race is not until October though. In the meantime, Dangdae Bulpae himself makes his 2013 debut in the Busan Ilbo Stakes down on the south-coast tomorrow afternoon. Busan Race Park: 6 races from 12:50 to 17:05 including the Busan Ilbo Stakes at 16:15. Busan hosts its first Stakes race of the year this coming Sunday as nine horses go to post for the Busan Ilbo Cup. One of the best Korean bred horses there has ever been. A three-time winner of the President’s Cup and the winner of more Stakes races than any other horse in Korean history. Against Korean bred opposition he should always be favourite at any distance between 1400 metres and 2000 metres and he will be here. The only consolation for his rivals is that he has never won when carrying more than 60kg and when he’s not on form, he’s really not on form. If he’s anything close to his best, he wins. Minister’s Cup winner in 2011, he struggled for form last year although he did finish 2nd in this race and picked up a win over the distance. He ended the year in good shape but will have to improve to win here but taking into weight and jockey, cannot be ruled out. A horse who has really crept up to class 1 under the radar. This will be his debut at this level and as such is a slightly unknown quantity. Seems to have plenty of improvement in him and will like the distance. Remarkably this colt hasn’t won since he took the KRA Cup Mile, the first leg of the Triple Crown, last April. The reason is that he only ever runs against the best. 3rd in the Derby, 2nd in the Owners’ Cup, 3rd in the Minister’s Cup, 3rd in the President’s Cup. He usually runs into just one or two who are faster. That could well be the same here. An out-and-out sprinter he was very exposed in the Minister’s Cup last year. If the race was 400 metres shorter, he’d be favourite. It’s not, so he is an outsider. The consitions of the race also land him with 61kg, the same as Dangdae Bulpae. She may well be Born To Win but she doesn’t do it very often and he’ll not do it here either. A pair of class 2 victories last autumn propelled her into the elite class and she beat some useful horses when finishing second over 1900 metres last month but there’s not much in her favour here. A wonderfully game horse and the defending champion. Yeonseung Daero has been campaigned almost exclusively against foreign-bred horses, hence “only” having 17 wins to his name. Struggled for much of 2012 but was right back in form at the end of the year, he can never be written off. Stablemate of Gyeongbudaero. A relative unknown who has risen to class 1 through placing more than winning. Has never faced a field of this quality before and while she does have a big weight advantage, it would be a surprise to see her involved at the business end of the race. He spent his 2-year old season in the USA and even ran in 3 races in Florida but Powerful Korea has never really lived-up to his potential. He has just a solitary class 1 victory to his name and while he has undoubted ability, will need to find a lot of improvement to win here. 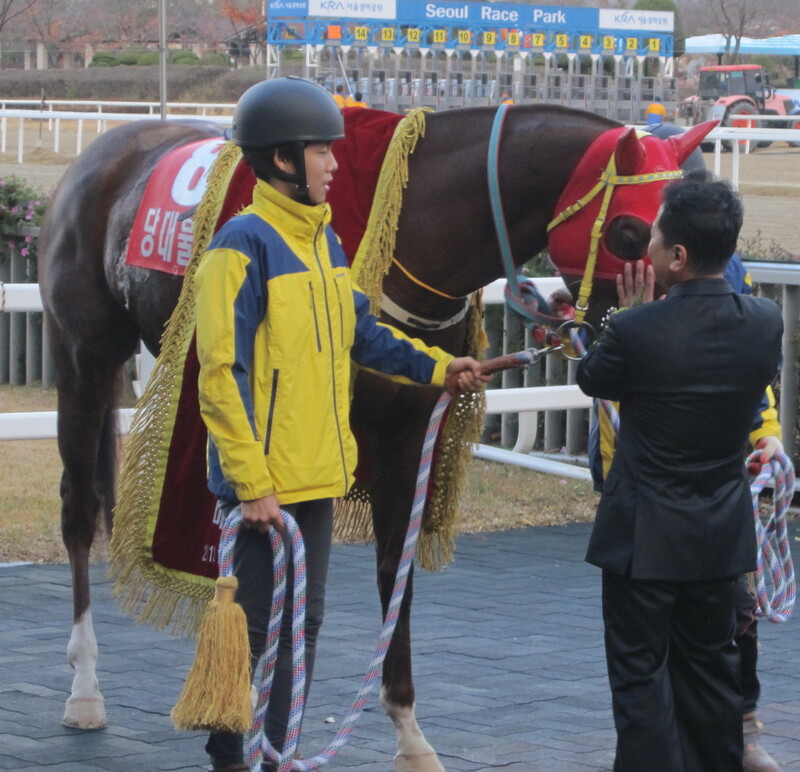 Gyongmaman’s verdict: Even taking into account the weight (which is too high – horses do not need to be carrying this kind of weight in a race that isn’t even a handicap but this is an argument for another day) it is difficult to look beyond Dangdae Bulpae for the win but there won’t be much value in that. Therefore, Gyongmaman will probably leave him alone in the betting and look for options involving Yeonseung Daero and Dongseo Jeongbeol both of whom are carrying reasonable weights, have good jockeys and are almost certain to run solid races. Dangdae Bulpae, Gyeongbudaero, Jigeum I Sungan, Feel So Good, Gamdonguibada, Lion Santa, My Key All in action! A spectacular weekend of racing by Korean standards is in store this weekend as a whole host of the nation’s top horses will be on show at Seoul and Busan. Will Yoo Byung Bok be greeting Dangdae Bulpae like this ahgain on Sunday? The feature race of the weekend is the Busan Ilbo Cup, the first Stakes race of 2013 to be run at Busan. Defending champion Yeonseung Daero (Creek Cat) will be there but it will be a tough ask for him to retain his title with competition in the shape of three-time President’s Cup winner Dangdae Bulpae (Biwa Shinseiki) and KRA Cup Mile winner Gyeongbudaero (Menifee). We’ll have a full preview of the race, including a run-down of each entrant’s chances, up on the blog on Friday. Friday is when things start off at Busan and there will be a couple of horses worth keeping an eye on. Being the half-brother of US champion Game On Dude, My Key (Macho Uno) has had plenty of expectations placed on him. He’s just started living up to them with two consecutive wins. He goes looking for his 3rd in race 8. Also on Friday, US import Yonggwanguijehyun (Rockport Harbor) will look for his 6th straight victory when he goes in the finale over 1600M. In addition to the Busan Ilbo Cup, Sunday at Busan sees a big class 1 handicap and it is in that race where current Grand Prix Stakes winner Gamdonguibada (Werblin) will make her 2013 debut. The 4-year-old filly won’t have things easy though as she’ll take on Lion Santa (Lion Heart) who returned to the track in style after a long lay-off last month. He has a record of 11 wins from 15 starts and if he’s in the kind of form he’s capable of, he’ll be tough to beat. Throw the ever dependable Viva Ace (Macho Uno) into the mix as well and ou Grand Prix Champion faces a challenging start to her campaign. Up at Seoul there is plenty to keep us occupied too. On Saturday, 2012 Korean Derby winner Jigeum I Sungan (Ingrandire) heads the feature race. He won his season debut last month and while he faces New Year Stakes victor Global Fusion (Menifee), as well as tough campaigners Singgereounachim (Exploit) and Geuma Champ (Vicar), he should be favourite. On Sunday at Seoul, possibly the hottest property in Korean racing right now makes his second appearance. Feel So Good (Ft.Stockton) spent nearly 2 years in the US and was a winner at Calder in Florida last autumn before being brought back home. He won his Korean debut by 10 lengths and steps up in class and distance in race 7. He should romp it. 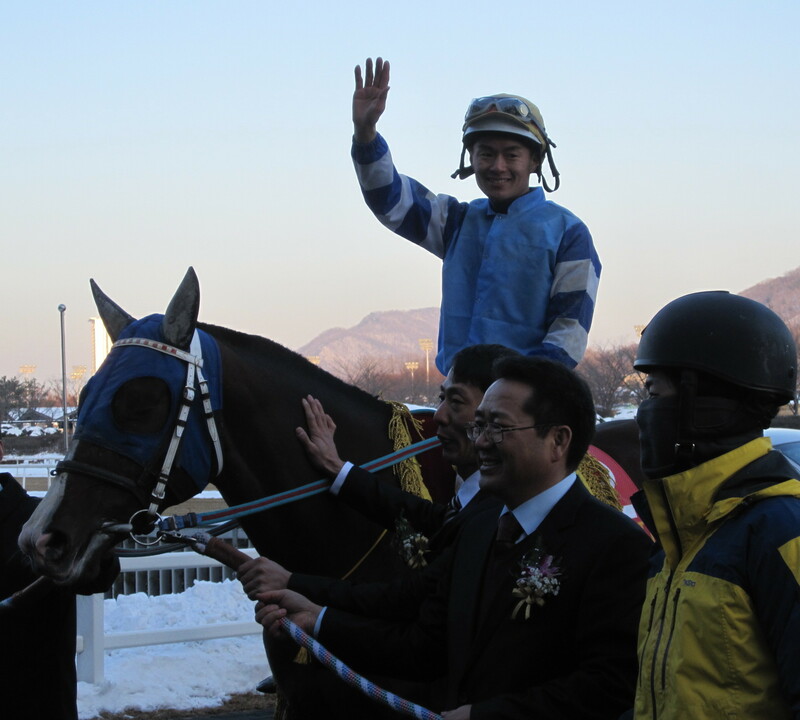 Joe Fujii won the Grand Prix Stakes, Korea’s most prestigious race on Gamdonguibada at Seoul on December 9th, becoming the first foreign rider to do so. However, it had been a quiet start to 2013 for the Japanese jockey. After the Grand Prix, he had to sit out the remainder of the season and the start of this after picking up an 8-meeting ban after his mount was slow into stride in a race at Busan (Fujii believed his horse to be injured). Things changed this past Sunday though as Fujii landed a treble, guiding Raon Bally, Raon Boss and Myeongun Jewang to victory. 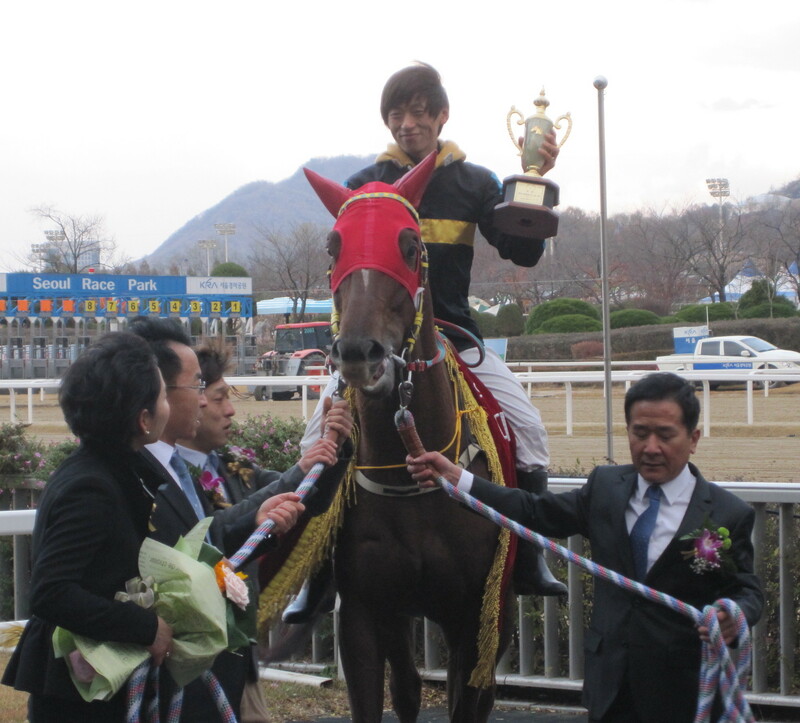 Fujii’s compatriot Narazaki Kosuke was also among the winners, keeping him in 2nd place in the Busan Jockey Championship. Fujii now has 34 wins from 236 rides at Busan while Kosuke has 62 from 462. 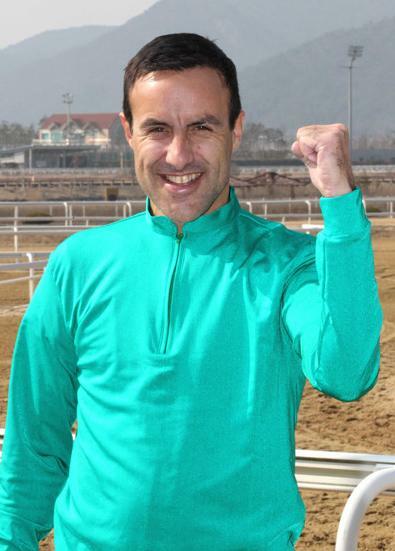 A new foreign jockey arrives in Korea this week – a big name from Europe. 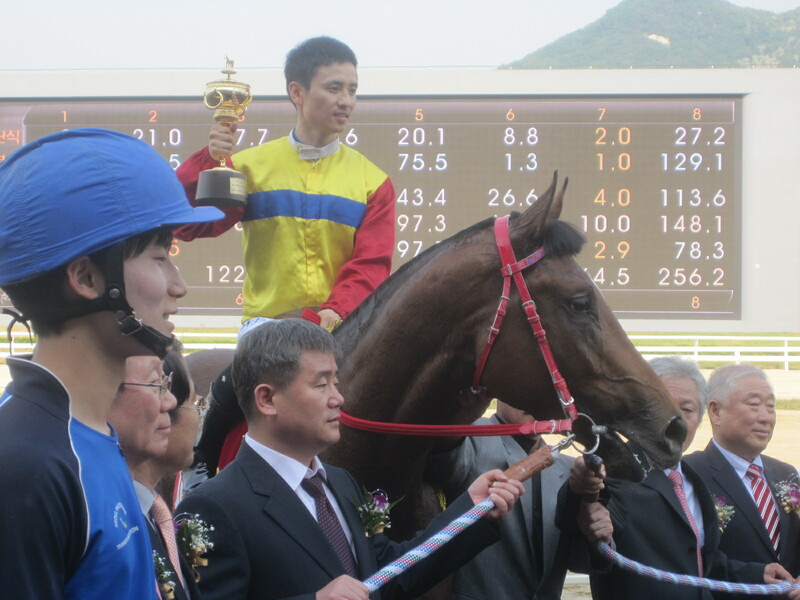 All three of Fujii’s winners were for Busan’s leading trainer Kim Young Kwan. Kim also trains Gamdonguibada and the champion filly is tentatively scheduled to make her 2013 debut at Busan next Sunday. Also coming up on Sunday, on Busan’s first really big race day of the year, is the Busan Ilbo Cup. While Dangdae Bulpae is set to be the overwhelming favourite, trainer Kim has two runners likely to start and Fujii could be in the frame to ride one of them. Dongbanui Gangja was in typically combative mood as he passed into Korean racing history with a retirement ceremony at Seoul Race Park this afternoon. The 8-year-old looked as though he’d rather be anywhere else than the Seoul Race Park winner’s circle that he graced so many times over the years after big race wins. Although eventually coaxed into posing for photographs for the hundreds of well-wishers who crowded around, he made clear his displeasure by bucking and kicking his way through a canter down the home-straight accompanied by a track pony. For jockey Choi Bum Hyun it must have been a reminder of the grief and the brilliance he got from Dongbanui Gangja as the pair won back-to-back Grand Prix Stakes and an Owners’ Cup among 20 career victories. Yet when he lost, he tended to do it in style with some monumental displays of petulance over the years costing him victories. He will be greatly missed. Dongbanui Gangja [Broken Vow – Maremaid (Storm Bird)], who was bought for $20,000 at OBS in 2007 retired with career earnings of $1.3 Million. He will go to stud at a private farm on Jeju Island. On the track, Indian Blue produced an impressive come-from-behind run to sweep to a convincing victory in the Segye Ilbo Cup. The 7 furlong race, one of few big races specifically for foreign-bred fillies and mares, saw 3-year-old Indian Blue (Henny Hughes) make up 11 places in the penultimate furlong before stretching away to win by 8 lengths from Dashing Platinum (Macho Uno) and Pureun Miso (Malibu Moon). Indian Blue, a $26,000 purchase from Fasig Tipton last May, now has 3 wins from 6 starts and has never finished worse than 3rd. * At Busan it was a great day for Joe Fujii. Since finishing 2012 on a high with his Grand Prix Stakes win on Gamdonguibada, the Japanese jockey has had a quiet start to 2013 with suspension ruling him out of the first few meetings. It all came right today, however, as Fujii notched up a treble, all for trainer Kim Young Kwan. First up was filly Raon Bally (Pico Central) in race 3, quickly followed by Raon Boss (Pico Central) for the same owner in race 4. 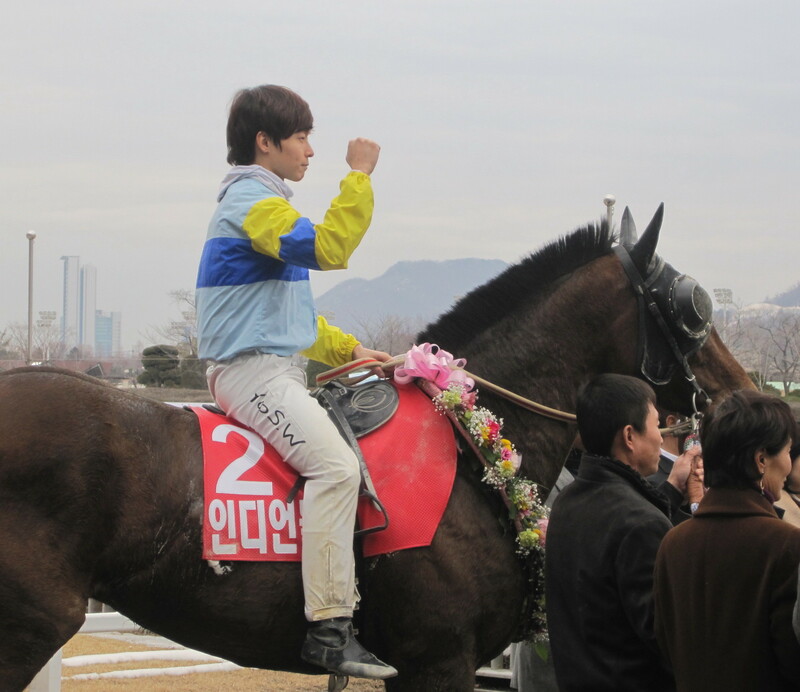 His final triumph came in race 6 on Myeongun Jewang (Forest Camp). Narazaki Kosuke was also among the winners today meaning 4 out of the 6 races on the card at Busan were won by Japanese riders. Next week sees the first Stakes action of the year at Busan in the shape of the Busan Ilbo Cup. Dangdae Bulpae and Gyeongbudaero are set to be among a very strong field.